I want to populate a dropdown list based on a selection of another cell's dropdown list. E.g., if the user does not make a choice from D20 dropdown menu, therefore F20 dropdown is Blank but has the option of only ChoiceA in its dropdown menu. If User does make a choice from the D20 drop-menu, therefore F20 is Blank but has options of ChoiceA, ChoiceB, and ChoiceC in its dropdown menu. 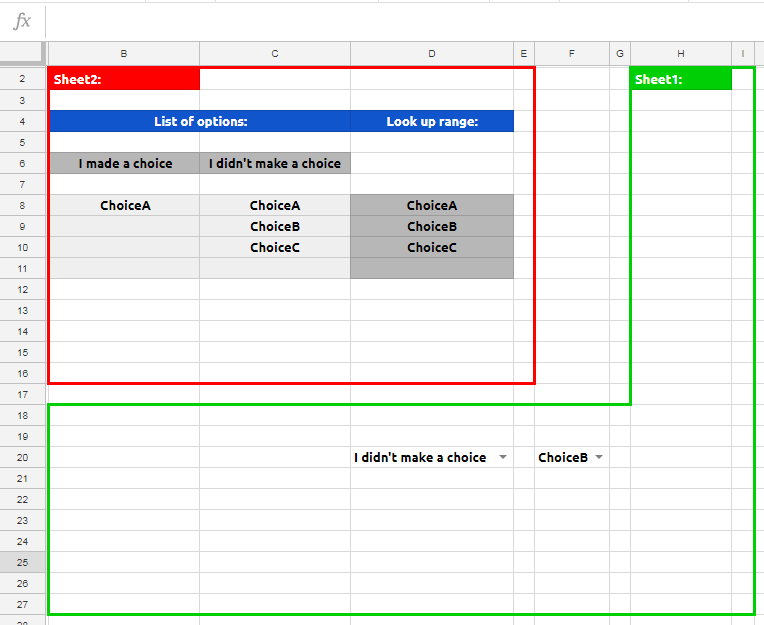 On a single line it works as needed, but when rows are added issue that arose is once a selection is made anywhere in column D that allows for all 3 choices in the F column drop-menu, then all 3 choices become permanently available in any added F column cells regardless of column D choice in the same row. Another issue needing a fix is if the option in Column D is deleted, all three options are also still available - although a warning comment is present. Can these issues be solved either with formula or script? If you need multiple validation rules for multiple cells, you should also have multiple ranges for them, so that the rules are tracked independently of each other. But the second issue, with an illegal choice staying in F after an edit to D, can't be solved with formulas alone. So I wrote a script that keeps better track of validation in column F. Note that it does not set the initial validation rules (before first use); that you can do manually. It also doesn't set rules for column D, which are static. What it does is the following: when a cell in column D is edited (header row excluded), it adjusts the validation rule of the cell two steps to the right accordingly. Additionally, if that cell contained a value such as OptionB that is no longer allowed when D is blank, the value in F is removed. In the script, e.range is the cell edited, e.value is its new value. Not the answer you're looking for? Browse other questions tagged google-sheets google-apps-script formulas google-sheets-query data-validation or ask your own question.